A few isolated mammal teeth from some Greek coal samples of unknown origin represent a small bothriodontine anthracotheriid, ascribed to Elomeryx. Analysis of the coalification stage of the fossil-bearing coal samples indicates the Lower Miocene Moschopotamos coal pits (Katerini Basin) as the most probable site of origin. The studied teeth are metrically close to E. crispus from Western Europe but share dental apomorphies with E. borbonicus, and E. japonicus and along with Elomeryx material from some Greek and Turkish sites pose a number of systematic, biochronologic, zoogeographic and phylogenetic questions. In the light of new evidence it seems that a small but advanced Elomeryx spanned the Oligo-Miocene boundary of S. Balkans. 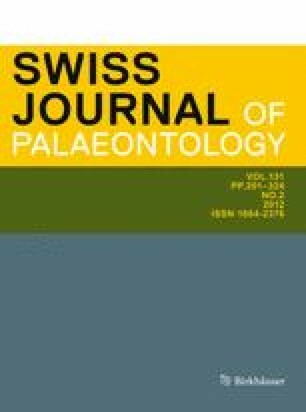 Furthermore, a revision of the old southern Balkan record together with a parsimony analysis suggest that Bakalovia is a first stage within the evolutionary history of Elomeryx, which complicated phylogeography is further discussed. The online version of this article (doi: 10.1007/s13358-012-0041-z) contains supplementary material, which is available to authorized users. An erratum to this article can be found at http://dx.doi.org/10.1007/s13358-012-0047-6. Thanks are due to E. Albayrak, L. Costeur, B. Didier, S. Ducrocq, Y. Islamoğlu, F. Lihoreau, G. Merceron, D. Nagel, A. Prieur, G. Rössner, and T. Tsubamoto for providing casts, photos, bibliography, access to collections, as well as for useful comments and suggestions. Coal samples from Avantas, Thrace, were kindly provided by G. Syrides. K.C. also thanks Riza Görkem Oskay, postgraduate student at the Department of Geology, University of Patras, for assisting in the reflectance measurements. G.D.K. thanks G. Rössner for giving him access to the collections at her disposal, as well as for help and hospitality. CNRS PICS 5185 financially supported D.S.K. during his visit to Lyon. We also thank the Executive Board of the European Association of Vertebrate Palaeontology (EAVP) and the Organizing Committee of the 9th EAVP meeting in Creta, Greece, where a preliminary version of this work was presented. M. Pickford and an anonymous referee are deeply thanked for their critical remarks and improving the English.